I promise I will post a full run-down of the weekend in Philadelphia (with pictures!) soon, likely tomorrow evening. The weekend was just too full for me to get to a computer. Tonight is a trip to Knit One and dinner at the Indian Oven with Jen and Lori, i.e., much yarn and curry goodness. Mmm, can't wait. Isn't he adorable? And oh so stylish, too. Next on baby's agenda: learn to appreciate natural fibers. ...you dream about knitting -- or, more specifically, making a mistake in your knitting and having to frog. Last night I had a dream that I was finally working on Forecast (unfortunately I did not happen to notice what size needles I was using to knit it or if I happened to be getting gauge) and that I kept forgetting to work the cables and had to keep frogging back and starting over. Then my alarm clock went off. Very weird. Must have been influenced by having to tink back about three rows on my reverse Pomatomus the other night. Aside from the obvious difference in fiber and color, you'll notice that the left sock has a shorter leg than the right sock. That's because I was an idiot and didn't read the very beginning of the pattern (i.e., before the chart) when I started and was thinking I needed to do 20 rows of ribbing. It was supposed to be 10 rows. But by the time I discovered my mistake, I was too anxious to get on to the patterning to rib back, and I figured I'd just tell eveyone it was a planned mod. And now of course I've ruined that plan because I've just told you the truth. Oh well, we all make mistakes. At least I cast on the correct number of stitches, and as you can see, the pattern reversal was successful. I still have some minor tweaking to do in the pattern rewrite, for which I'll have to knit another sock, but I'll be sure to share that info with all the Pomatomus knitters out there when I'm satisfied. 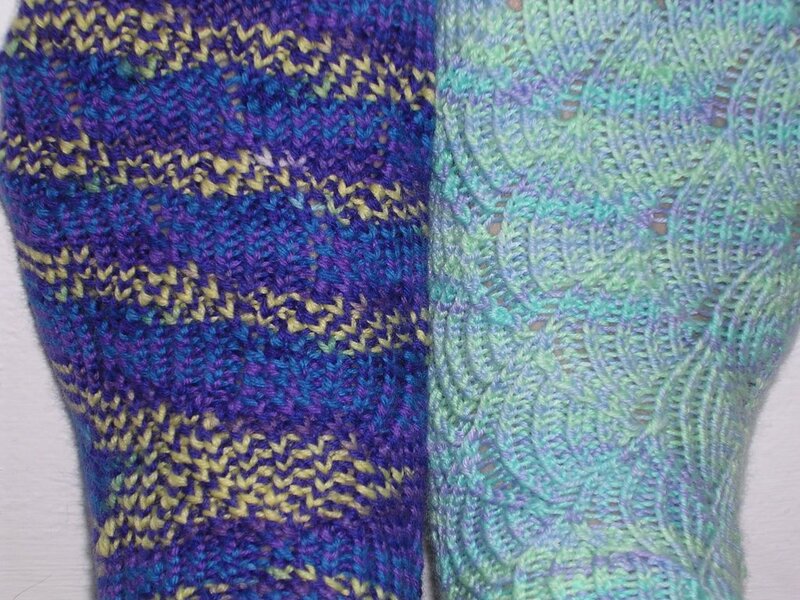 My travel knitting sock (at right) is almost done, but alas, I think it may be too small. I think I'm becoming a tighter knitter, because I'm using the size needles the pattern calls for (US 1) but I think I'd really need a US 2 to make them the correct size. I am going to finish it anyway and hope that a little bath makes the wool relax a bit. They'll be snug, but just maybe they'll work. In this case I think I must have had some amazing foresight, because when I ordered all that sock yarn from Knit Picks a while back I ordered three balls of each color. So even if I can't manage to make this one work, I've still got a pair's worth of yarn left over. I still haven't started Forecast, in part because I haven't decided what to do in terms of needles. 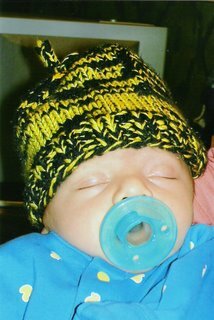 I've been wondering if I should knit another swatch with US 9 needles. I'm still mystified regarding what is going on with gauge. I am using Cascase 220; the pattern calls for Cascade Tweed. 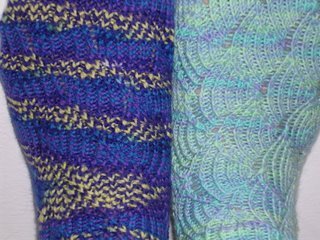 Can the two yarns really be that different in terms of gauge? Moreover, why is is that I'm getting the exact same stitch count with two different sized needles? Grrr, the maths. This is my least favorite part of knitting -- next to the fact that I can't do it all day and/or for money. On the agenda this evening is to start the first Pomatomus for my mom. I'm hoping to get a decent amount done before we hit the road on Friday, even though I know I'll have many good hours of car knitting, If I'm really on top of things, I think it might even be possible to finish the pair by the end of the holiday weekend (you know, so my mom can have her wool socks right when the weather starts getting seasonal again). I also want to have something pretty to pull out of my purse to show the Jeopardy! people. Maybe I'll even show them how I reversed the pattern and they'll be so awed by my creativity and intelligence that they'll want to put me on the air right away so I can win lots of yarn money. Okay, maybe not. 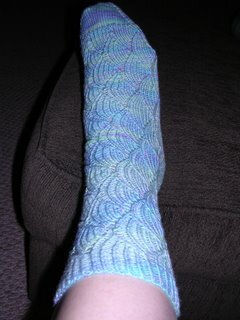 But at least I can show it off at Rosie's where I bought my first sock pattern and sock yarn, way back when. Finally, a little shot I forgot to post last time. 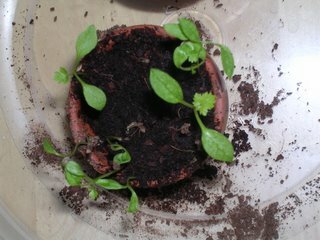 The answer: this is the adorable herb growing on top of SJ's bookshelf. Question: What is parsley, Alex? 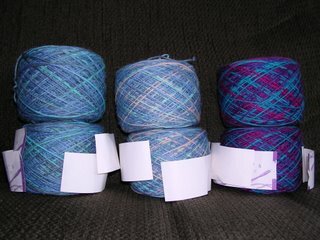 Here you see (left to right) the colorways Cool for J's mom's socks, Jay Pond for my mom's socks, and Uptown pour moi. These looked gorgeous in the hanks, and even prettier in these lovely cakes. I can't wait to get started. I still want to finish the "prototype" of the Pomatomus reversal before I start my mom's socks, and I still have to talk to J's mom to find out what pattern she wants, but at least I'll be ready to go once those two issues are settled. Two pairs of Addi Turbo 16" circs (US 0), two pairs of Inox 16" circs (US 1), one set of bamboo dpns (US 1), and four balls of Fortissima Socka (75% superwash wool, 25% polyamide) in black and charcoal gray. The yarn is, as you may have guessed, for socks for J, who prefers "plain" colors in his socks. Perhaps these he will actually wear outside of the house. J and I had a very nice weekend. We went out to see The Da Vinci Code Friday night. The theater was packed, let me tell you. I loved the movie, but J was apparently bored and slept through about an hour and a half of it. I had just finished rereading the book earlier in the week, and although there were some minor changes to the plotline and some omissions of unnecessary story elements, I thought they did a great job bringing it to the screen. If you liked the book, I highly recommend seeing it. That is, of course, unless you're like J and will be bored by already knowing what's going to happen. This morning we had breakfast at Panera and then spent some time at Barnes & Noble, where I picked up the Yarn Harlot's newest book, as well as this book (which you just have to look at, if only for the cover picture). I'm excited to start reading both -- perhaps on our road trip to Philadelphia next weekend. Have I mentioned the trip and why we're going? I have an audition with Jeopardy! I took the online contestant test a month or two ago, expecting nothing, and then was shocked when I got an e-mail inviting me to come audition in person. I don't necessarily expect anything to come of it, but it can't hurt. 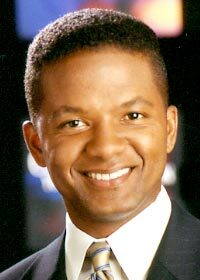 Plus I'll get show J around campus and my old neighborhood in Center City. Yes, it is the third Wednesday of the month, and yes, I am at home rather than at knitting meet-up at Barnes & Noble. It's already been a very busy week at work, my eyes are tired, and I wasn't thrilled by the idea of trying to drive in the dark. Plus, I thought I'd get a load of laundry done while I'm home. Unfortunately one of my neighbors, whom I will hereby dub the Lazy Launderer, had the same idea. This person decides to do laundry but isn't very punctual about changing machines. His or her first load sat in the washer for at least half an hour before s/he decided to transfer it to the dryer -- and of course put in a second load at the same time. I have a strong suspicion that it is the same Lazy Launderer who, a couple weeks ago, had a wet load of clothes sitting in washer for a good two hours. I wouldn't care so much except that in the load of laundry I need to do are my towels, which I do need to shower tomorrow morning. The laundry issue is not the aforementioned conundrum, however. Remember how I was going to knit a sweater, like, last week? Although the Mother's Day socks have moved ahead of in the queue, I've been swatching since my Addis arrived from Knit Picks. Therein lies the problem. First I did a swatch on the US 7s that the pattern called for. Didn't make gauge (I got 18 stitches over four inches instead of 16 stitches). So I pulled out a pair of US 8s and did another swatch -- and got the same exact stitch count! Frankly, this doesn't make any sense to my math-impaired brain. I understand gauge enough to know that if I have more stitches than I should in my swatch, the width of my garment will be less than the pattern specifies. But we're talking an extra half a stitch per inch. Plus, the swatches were pretty stretchy, so I would think the ease would help hide the off-gauge-ness. Here's the dilemma: considering the identical stitch count in both swatches, do I use the US 7s, which are my preferred Addi Turbos, or the US 8 Susan Bates circs, which are less preferred? Any input is very welcome! This picture doesn't capture the true color of the yarn -- it's the Morning Glory colorway of Knit Picks Sock Garden, and the shade are royal purple, deep bluish purple, and bright yellow. Finally, a note to my readers -- where did you all go? I haven't received a comment in a week, and I'm starting to wonder if I said something to offend everyone. Sorry if I did (and, hey, could you let me know what it was that ticked you off so I won't say it again?). I'm not really finishing for comments here, but darn it if I did get a little used to getting at least a couple to each post. I guess the semi-popularity went to my head. A bit, a bit. Mods: I did a doubled cast on to make the leg a little stretchier (J doesn't like his socks to be tight around the leg) and also omitted one pattern repeat in the leg because I was worried about running out of yarn. 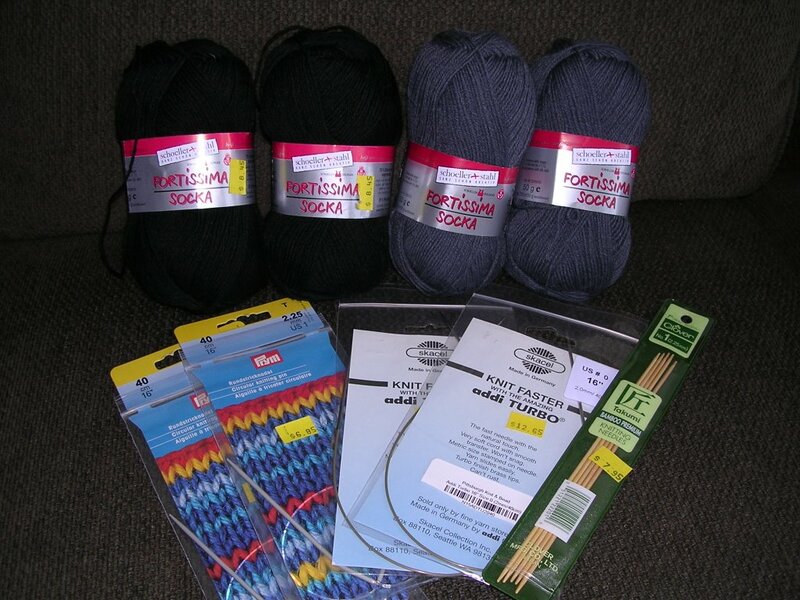 That turned out to be a good move, as I had just enough yarn. There's just a tiny bit left that I can keep for repairs. So far the verdict is positive on these. J fell asleep in them last night and this morning reported that his feet were nice and toasty. Maybe not what he wanted for this time of year, but come next winter I'm sure they'll be appreciated. Doesn't this just look luscious? 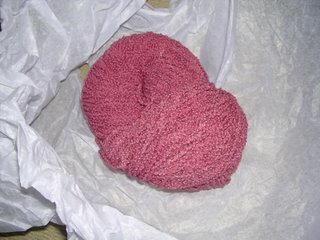 This is the hand-dyed colon/lycra sock yarn I purchased from the Greenwood Fiberworks Etsy shop. The colorway is called something like Strawberry Milkshake, and trust me, it looks good enough to lick (although that might leave some unwanted fuzzy things on my tongue). It came with a very friendly, handwritten note from Carolyn, thanking me for my purchase and offering me a nice little discount on my next purchase as a thank you. My favorite thing about the packaging was that the yarn was neatly wrapped up in tissue paper (which you can see I mangled in my excitement), sealed with a little sticker reading "Thank Ewe." This woman knows her business, and she clearly knows knitters! I have yet to do anything with this yarn, but I love it already and I know I'll be a repeat customer! Now, on to my favorite obsession. You guessed it, it's SOCKS. 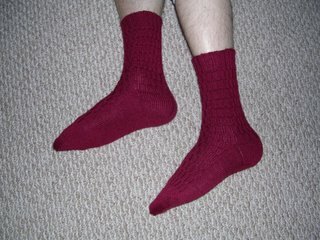 I decided to give both my mother and J's mom the same thing for Mother's Day: a hand-knit pair of socks, made to their specifications in terms of pattern, fiber, and color. 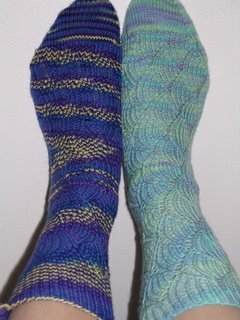 I just measured my mom's foot a little bit ago, and showed her some patterns and let her feel some sock yarn. She went right for the good stuff, so it looks like she'll be getting a pair of Pomatomuses in Lorna's. 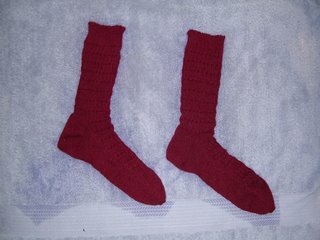 While we were discussing this, my father just casually happened to mentioned that he wouldn't mind a pair of socks either, so I'll be adding another pair of Gentleman's Plain Winter Socks to my list of socks to knit. In the meantime, I'm nearly done with the leg of my Child's First Sock, which looks nice but strangely doesn't seem to look like the picture in the book (is it possible I'm doing my YOs incorrectly?). 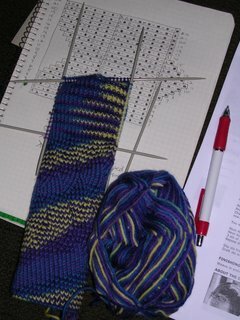 I've also finished up the first sleeve of Trellis, and completed a swatch in preparation for Forecast. My WIP list will definitely be undergoing some shuffling this week in terms of priorities. For a moment there I found myself without a SIP (Sock In Progress), so I had to cast on another one for my work knitting. 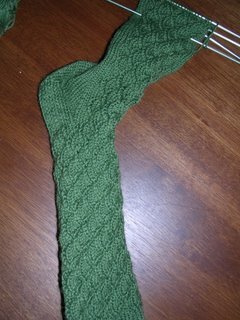 I decided to do Child's First Sock in Shell Pattern from Knitting Vintage Socks, in a lovely shade of green in Knit Picks Essential. I will spare you from a progress shot, since right now there's little more than 2o rows of K2P1 ribbing. Now that my travel project is settled, it's time to pull out an old WIP for my home knitting. Remember this? Here is Trellis, which by my reckoning has been sitting untouched since before the start of the Knitting Olympics (here's proof). I'm not especially rushed to finish this -- the intended wearer isn't due to make his debut until July -- but I thought it would be a good idea to get a move on before my Addis come (tomorrow, I hope!) and I get all distracted by Forecast. Now I'm off to play some more Da Vinci Code quest -- Yvonne has got me hooked! I've been a surprisingly monogamous knitter the past week. 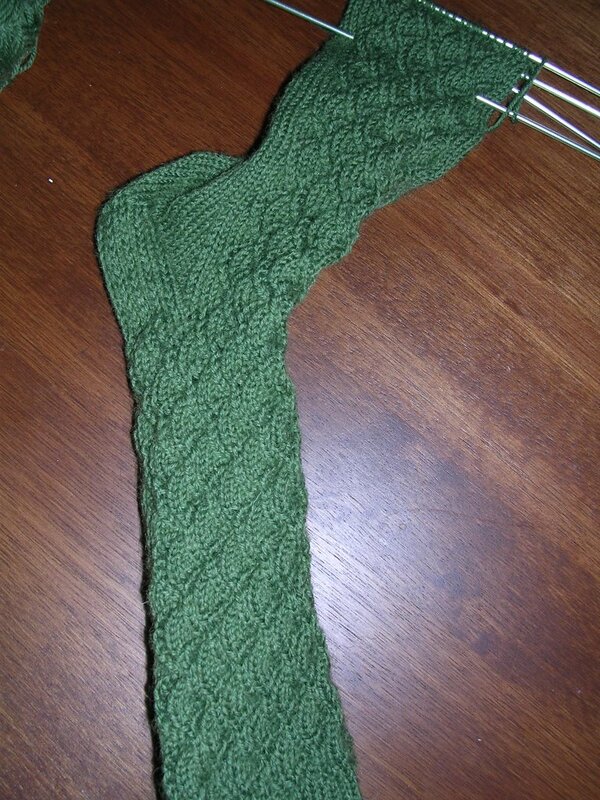 Ever since I finished the first Pomotamus, I've been focusing all my attention on J's sock. 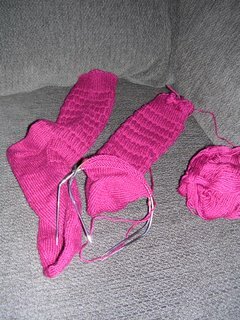 This is not the best picture -- the socks are actually burgundy, not pink -- but here you see the first, completed sock on the left and approximately two-thirds of the second sock (I'm several rows past the completion of the gussets in the foot). J tried on the first sock this weekend, and it fit him perfectly, nice and cozy. I'm planning on focusing almost entirely on the second sock this week so that he'll have the completed pair by this weekend -- so he can put it in a drawer with the other socks I've knit him until next winter. Oh well, thus is the paradox of the obsession of sock knitting. 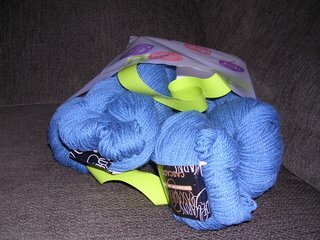 Here are four skeins of Cascade 220 in color 8339 (Knit One calls it "Marine"). This is destined to be Forecast, pour moi. I was inspired after I saw Carrie's version -- so cute! 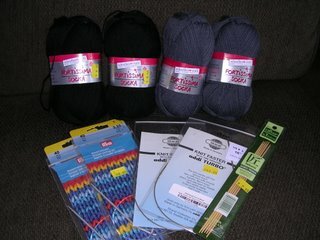 The necessary Addis have been ordered care of Knit Picks, and once I publish this post I will be setting up my swift and yarn winder to make me some yarn cakes. Not much other knitting to report. Haven't started the attempt at reversing the Pomatomus pattern. Maybe once J's socks are done. I continue to be amazed by the comments I've been getting -- not only because they've been so nice, but I've been shocked by the fact that I have readers outside the U.S.! By my count, I've now received comments from three continents (that would be North America, Europe, and Australia). Hello especially to Dipsy, who decided to de-lurk. I'm curious how all of you who are outside of my immediate area found me. Please leave me a comment and let me know! Yes, I know it's been almost a week since I last posted. I've been busy, and not just at work. I've been spending good chunks of time working on socks, as you'll see below. Pomatomus #1, il est fini. I finished it up last night while watching the end of Proof (excellent movie, by the way). Although I had no major issues in the leg portion, I had some wonkiness going on with the foot -- specifically, each time I finished Chart B and started over, I wound up with 38 stitches in row 1 (I was supposed to have 37 for rows 17-22, and 36 for the remaining rows). Any other Pomatomus knitters have this problem? I "solved" this issue by throwing in an additional K2tog at the end of row 1. That got me back to the correct number of stitches and, to tell the truth, I couldn't see any difference on the pattern. 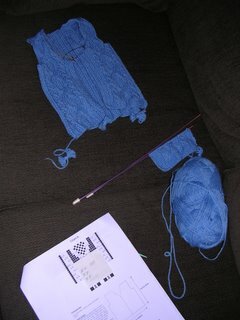 I have not yet started sock #2, because I'm toying with the idea of doing a little pattern modification. You see how all the scallops in the pattern go the same way? Well I was thinking that I'd really like the scallops in the other sock to go the other way, so that the two socks look like mirror images of each other rather than exact copies. The way my brain works, I think it should work if I just reverse (i.e., make a mirror image of) the charts. Has anyone tried this? Think it'll work? I think I may try it with some scrap yarn. I'll keep you posted. My general reaction to this pattern is that it's really much, much easier than it appears. I whipped this sock up so fast it shocked me. For those of you who find it too intimidating (ahem, Yvonne), you may want to try it with some cheap-y yarn so you can get the hang of it. The charts do look complicated, but if you look at them closely, you'll see that, with the exception of a K2tog and a YO in each pattern repeat, the rest of the stitches are just K, P, K, P. Easy peasy! I'd like to add that this is coming from someone who is not a fan of charts, so that's saying something. The reason I'm posting this now is that I noticed that Carrie commented on my last post. I've been reading Carrie's blog for a little while now, and have come to the conclusion that we might be twins. There are just way too many eerie similarities. We're both natives of Western PA. We both deal with words and language for work. We both knit and crochet. 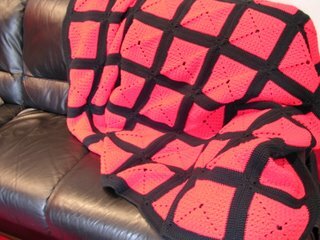 Our boyfriends have the same name -- and, it seems, nearly the same afghan. Need proof? Take a look-see. Scary, no?